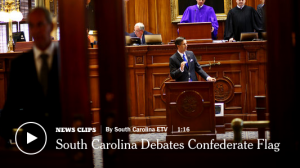 The South Carolina Senate voted Monday to remove the Confederate battle flag from the grounds of the State House. The bipartisan proposal, which emerged after last month’s massacre at a historic black church in Charleston, was approved by a 37-to-3 vote in the Republican-controlled Senate. The Senate has one remaining ratification vote, now virtually assured of success. The debate will shift to the House of Representatives, which Republicans also dominate, where the timeline for — and tenor of — the debate remains less clear.